Atletico Madrid are set to take on AS Roma in the UEFA Champions League game on Wednesday night, 22 November 2017 in what should be a cracking of game at Wanda Metropolitan in Madrid. Atletico have must win this game to stand a chance to qualify for the knockout stages and if they can win both of their last games they will qualify regardless other results in the group. The game kicksoff at around 20:45 CET / 19:45 uk time and BT Sports will have live coverage in the UK. AS Roma visited Santiago Bernabeu on Tuesday night in order to overturn the 2-0 deficit having lost at Rome in the first leg. Roma had several easy chances in the first half to make Real Madrid pay and put them under pressure but Dzeko and company left their scoring boots at home. Real Madrid finally break the deadlock in the game when Ronaldo scored from two yards in 64th minute while James Rodriguez made it 2-0 minutes later to kill the tie. The game turned on its head after break when Ronaldo scored and minutes later James Rodriquez scored to make it 2-0 and Real Madrid lead 4-0 on aggregate. Real Madrid will be delighted with the 2-0 win away from home which kind set them up nicely for the return leg at home in a couple of weeks time. Roma need to get one of the historic results in their history at Bernabue to turn this tie around where Real Madrid has scored 20 goals in last 4 home matches. Since the game is kicking of at around 20:45 CET and if you missed the live action you can tune in here after the match to find full match extended highlights which will be available immediately after the game is over. It will be the first European game for Zinedine Zidane since he took over Rafael Benitez as Real Madrid manager couple of months ago. The first tie is crucial for Real Madrid’s chances of qualifying for quarter final stage against a Roma side who has not qualified beyond group stages since 2011. So on paper it should be a straight forward affair and Real Madrid will be heavy favourites to go through since they are playing the second leg at home. Real Madrid will still be without Gareth Bale who has not fully recovered from his calf problem. Which means Ronaldo and Benzema will start upfront who have scored 31 goals together in the last 15 odd games. Marcelo has recovered from his recent injury and should start the game alongside Ramos, Varane and Carvajal in the four man defense. Roma are likely to go with the trusted 4-2-3-1 system where Dzeko will start upfront while playmakers Pjanic, Salah and De Rossi should start in attacking roles. This is how I expect both teams to lineup on Wednesday. Real Madrid are in such great form in their domestic league that bookmakers have them mighty favorite for this clash but European football is total different ball game and Real Madrid must get a decent result in Rome if they want to make it through to the next round. 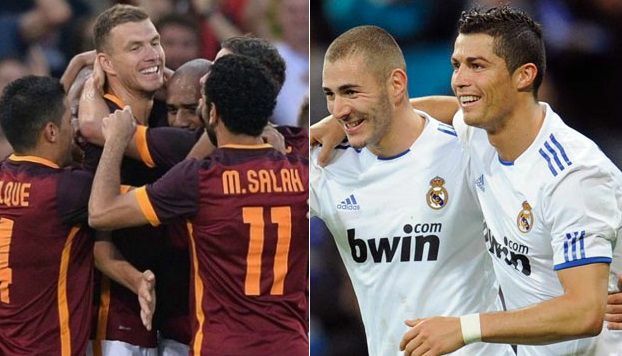 Ronaldo, Rodriguez and Benzema are in superb form and should have enough in their locker to see off of colour Roma side. I am going with a 2-1 away win for Real Madrid. First Leg Review: AS Roma produced a typical italian performance where they sit back and hit Real Madrid on the counter attacks throughout the first half. Real Madrid failed to breakdown resilient Roma defense who were very organized until a moment of magic from Real Madrid’s star player Ronaldo who put the ball in the back of the net in 57th minute with a help of deflection to put Real Madrid 1-0 up while Jese scored late in second half to make it 2-0 and pretty much kill the tie. Cristiano Ronaldo silenced his critics when the put Real Madrid 1-0 up in second half scoring that important away goal which might prove to be huge on aggregate. Roma had their chances in the first half and early second half but they fail to to take advantage of the chances. Jese Rodriguez came on as a sub to score Real madrid’s second of the night and pretty much end the contest. Roma had their share of chances but they were not clinical enough in front of the goal.